The Rock Rebel Cover Reveal is Here! 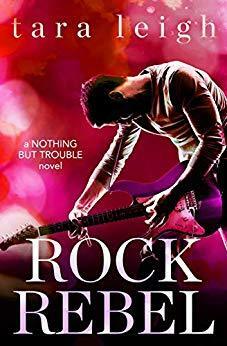 He's a rock star with a secret; she's a pop princess with a painful past, can their forbidden romance survive, or will their lies destroy them both? I've earned my bad reputation. A few years ago, I was New York City's hottest classical music prodigy. But I wanted something else, something more. So I chased my real dream, and now... I'm rock royalty. Dax Hughes, lead guitarist of Nothing but Trouble. But to my family and former Juilliard classmates, I'm an outcast. A misfit. A rebel. They're not entirely wrong. I don't give a damn what other people think, and I'm all for breaking the rules... except when it comes to our new opening act, Verity Moore. Rock gods don't tour with pop princesses. It's not personal. Actually, under that fallen diva reputation, Verity's incredibly talented. And her fiery redheaded personality is... intriguing. But I'm convinced the skeletons in Verity's closet are as scandalous as my own, and when we're not sparring, she has a way of drawing out all those secrets I'm determined to keep hidden. PENTHOUSE PLAYER IS ON SALE! If you've been meaning to dive into Tristan & Reina's story—here's your chance to do it for only .99c!